The story of my love affair with Gigi New York started the way many romances do: through a friend. I had seen one of their monogrammed bags on one of my favorite blogs, The Love List, and decided to take some of my own IFB-given advice and email them with a pitch. We hit it off, one thing led to another and suddenly I was gushing to all my friends and hosting a giveaway on my blog to spread the love. What gets me most about my GiGi clutch (I have this one) is how simple, functional and beautiful it is. The snakeskin embossed look gives it texture, the tassel gives it character and the monogram makes it special. The Uber Clutch, above, is big and roomy without being over-the-top. I'm kind of obsessed with all the colors, but the yellow seems like the perfect pop of color to give a standard winter outfit a little somethin' somethin' extra. Who makes your go-to clutch? I don't have a go-to clutch, but I'm putting that black one on my wishlist! I remember that giveaway! 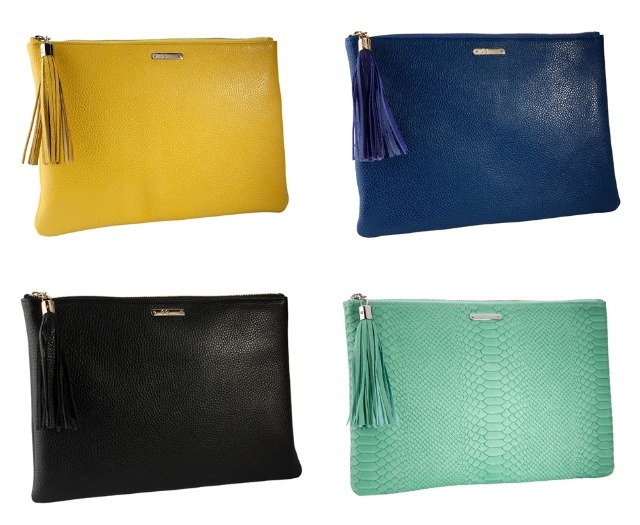 I have been loving the Gigi clutches from afar for ages, but have yet to pick one of up for myself. The hardest part is picking just one of those fabulous colors! I did just get the Marc Jacobs for Target clutch and am pretty obsessed with that too!